At Overhead Crane & Conveyor Services, we design, manufacture, and install multiple types of overhead conveyors used in a number of applications which routinely require the lifting of heavy loads. Crane types include top running, single girder, double girder, and enclosed track systems with capacities of up to 30 tons. Our cranes are constructed out of structural steel with an epoxy paint or a plated finish and are built in lengths up to 62′, spans up to 60′, and lifting heights up to 120′. Premium quality aluminum extrusions are used in designs with enclosed tracks, and many custom options such as corrosion resistant chain or radio control capabilities can be incorporated into the design as requested. 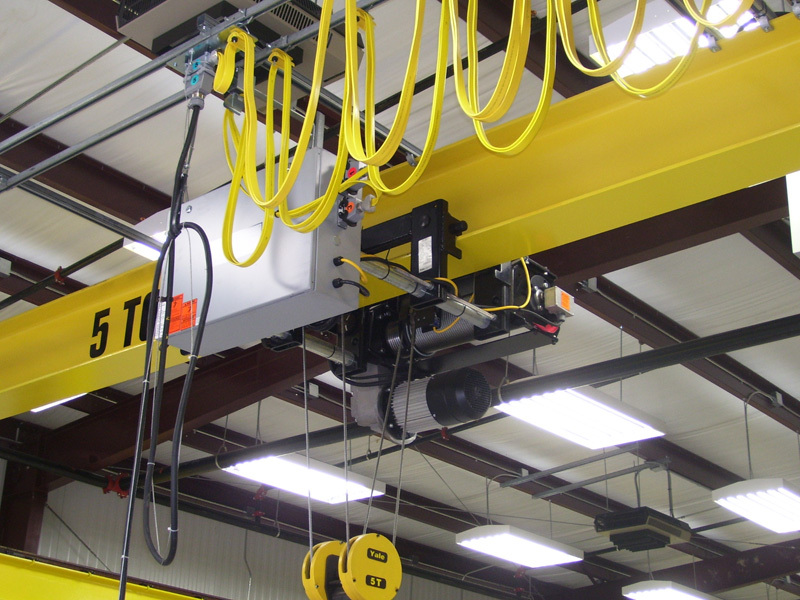 Overhead cranes are essential to many injection molding, stamping, and material handling operations and choosing a trusted partner to design and install a crane is critical to the safety and reliability of the equipment. We installed our first cranes over 30 years ago, and many of which can still be found operating at the Fort Campbell Army base in Kentucky. To date, we have installed hundreds of cranes regionally for industrial molding, metal stamping, and industrial distribution customers, among others. Additional services include OSHA inspection and the repair of existing cranes. Continued support after installation is an essential part of our commitment to providing the best customer service in the industry. The lead time for custom overhead cranes average 6 to 12 weeks, depending on the specific project. For additional information about our overhead crane design and installation capabilities, see the table below, or contact us directly.